As the days go by and October grows closer I think about what I want to write about. My first thought is to make a list of all my favorite words. I have many and love to play with words and how they sound as well as the shape of them. While doing a Google search for a beginning poet I discovered something wonderful. Magnetic Poetry. No this isn't something that I knew about but it seems like a very helpful tool. You simply put these wonderful word magnets on, okay you could use your refrigerator but you could also get one of those magnetic boards to place in your writing area. You then play with them, rearrange them to your hearts desire. That is not to say to only use these words but it may help jump-start things, awaken the inspiration for more words that will easily flow onto your page. 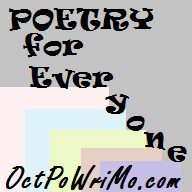 Tip 8: Discover new tools for creating your poetry whether the Magnetic Poetry or something else equally fun.